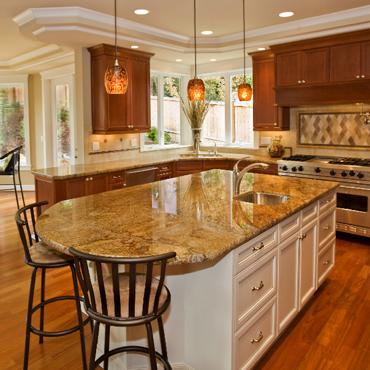 Since 1995 our full time focus has been on crafting natural stone surfaces as our primary business – specializing in kitchen countertops, islands, vanities, fireplaces, shower panels, granite and marble tile. At Granite-Tops, our philosophy is simple . . . meet not only our customers' needs, but also their expectations. We cut no corners when it comes to quality. This is evident in the homes and businesses that display the lasting beauty of natural stone and the quality workmanship and professional approach of Granite-Tops. With our three Minnesota locations, we are better able to conveniently and efficiently service our customers. As one of the largest fabricators in the mid-west, we are well equipped to handle both residential and large commercial projects. Our corporate office and main production facility includes more than 75,000 sq. feet of state-of-the-art manufacturing and fabrication capabilities. We also have offices in Plymouth and Albertville which allows us to serve the metro area as well as western and central Wisconsin. When you choose Granite-Tops, you’ll see that our commitment to quality is shared by the more than 85 professionals on staff. This combined with production capability, capacity and dedication to craftsmanship and service positions us well ahead of our competitors.